Some are calling it a silent epidemic. The rate of children showing signs or symptoms of a mental health disorder are increasing - estimates as high as one in five children in the U.S. The above statistic from the Center for Disease Control means a teacher may have five students in a classroom of 25 who show up to school with mental health issues, ranging from depression to anxiety to substance abuse. Those five students may have trouble focusing on academics, and the entire classroom and teacher is likely impacted. Many schools struggle to address this increasing trend, particularly high schools given that mental health issues tend to increase with age. In response to this alarming trend, the Acalanes Union High School District (AUHSD) prioritized wellness for its students. 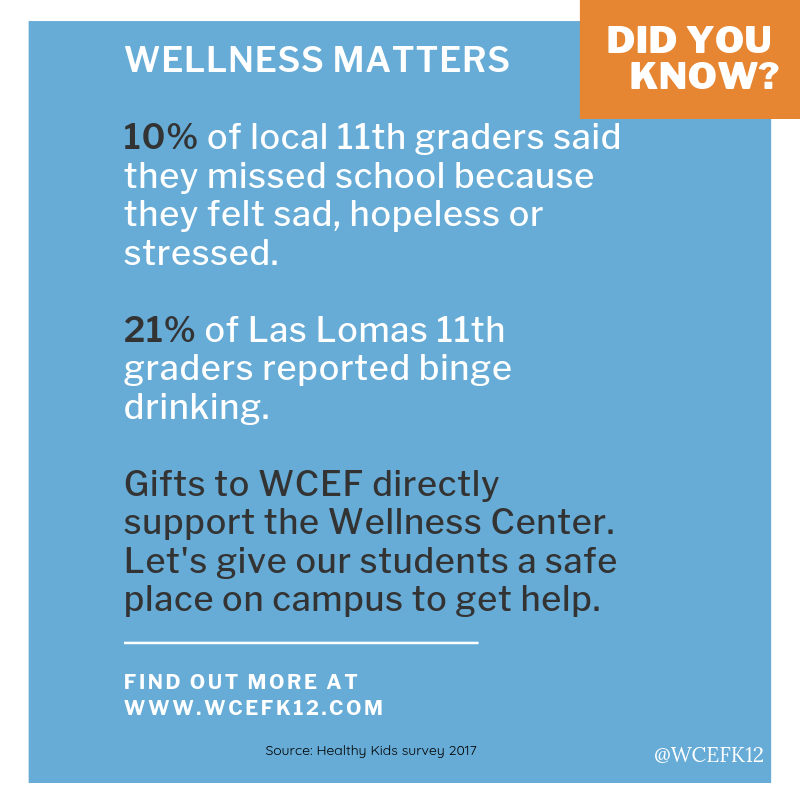 In October of 2017 Las Lomas High School opened its Wellness Center on campus, with plans to open Wellness Centers at all four campuses by 2018. The on-campus center offers individual counseling, crisis support, groups, and other interventions to help students with stress, depression, bullying, gender questions, grief, drug and alcohol abuse, anxiety and more. On average the Center sees eight to 10 students a day. Recent data on 11th graders in our district speaks to the need for more supports for students. 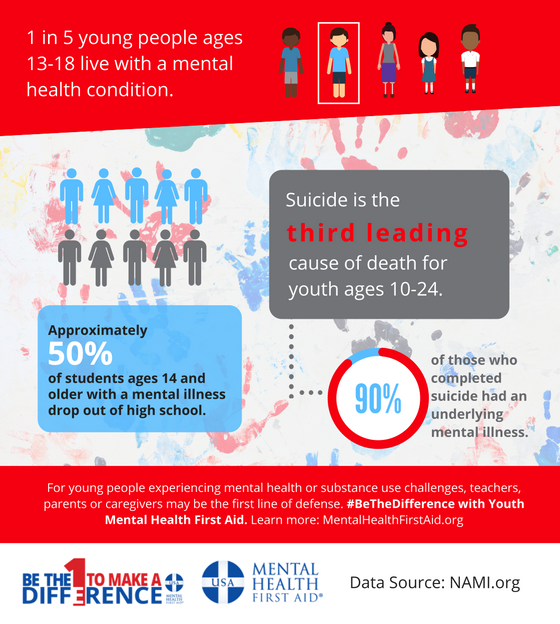 According to the anonymous California Healthy Kids Survey that most 9th and 11th graders across the district took in November 2017, one in five 11th graders said they seriously considered suicide in the last 12 months. Our local students’ response was higher than the statewide average of about 17%. In addition, more than 10% of local 11th graders said they missed school because they felt sad, hopeless or stressed. “We operate on a prevention model. You don’t have to have a diagnosed mental health issue. It is more about how to help give students support before they have a crisis,” Martinez said. However, due to inadequate funding for public schools, and expected declining enrollment in the coming years, AUHSD is only able to offer its students a part-time Wellness Coordinator. Without adequate funding, this means the Wellness Center is forced to prioritize cases, and if sometimes forced to delay seeing a student to schedule a student with more immediate needs. Martinez said some students deal with mental health issues by turning to alcohol, drugs, vaping, anger or other destructive behaviors. The Healthy Kids Survey showed that our district 11th graders’ alcohol use in the past 30 days was higher than state average - almost 35%, compared to less than 30% statewide. Even more concerning is the rate of binge drinking (defined as five or more drinks within a couple of hours) in the past 30 months: 21% of our 11th graders reported binge drinking. The fact that 11% of our 11th graders have used stimulants, such as Ritalin or Adderall, for recreational purposes was also higher than the statewide average. “We teach them coping strategies, so they can deal with what’s going on in a healthy way. We want students to get support quickly and help them be able to learn when they are in the classroom,” Martinez said. In just the first three months of this school year, there were more than 500 student visits to the Wellness Center. Many students drop by the Wellness Center to help themselves “cool down” from some sort of situation or to request support with an issue they are dealing with, while at least a quarter visit for a scheduled appointment for individual or group support. Students from all grade levels use the Center, although more than 60% are juniors and seniors. The Wellness Center also helps train teachers on best practices for supporting students with mental health issues, and hold various events aiming to educate parents of students about mental health issues. The Wellness Center collaborates with the school’s Counseling Department and Health Office, and was the first Wellness Center in the Acalanes Union High School District. Funding for the Wellness Center comes from WCEF, as well as district funding and grant funding to address health and mental health. showed improvements in their academic performance, such as improved quality of work, improved grades, or improved attendance. WCEF is proud to help provide funding to the Wellness Center, and is actively fundraising to help the Wellness staff keep up with the demand for their services. This semester the district plans to survey students to inform efforts to ensure all students in need have access to Wellness Center services. For more information about the Las Lomas Wellness Center, go here. Anxiety symptoms are real. Depression is real. These things interrupt their lives and their ability to learn.